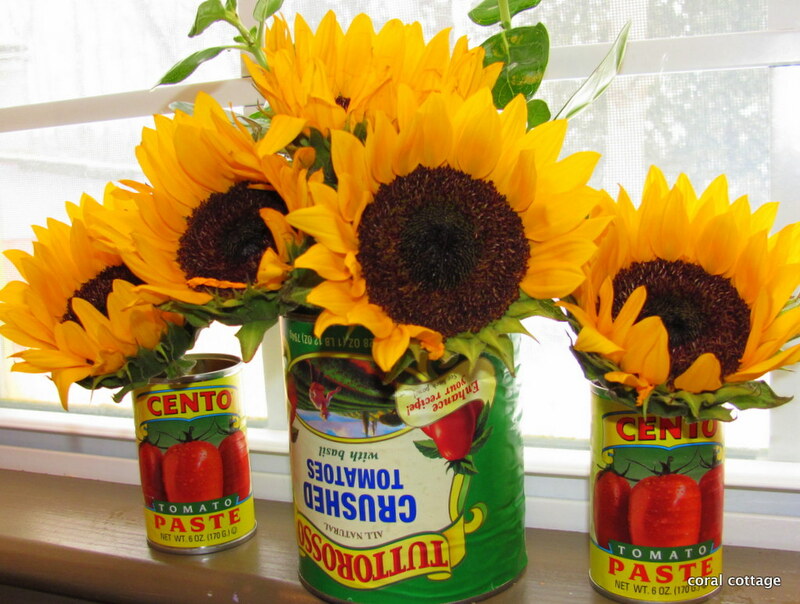 After draining the tomato cans of their contents for the following recipe, I plop in some sunshine from my sweetie. 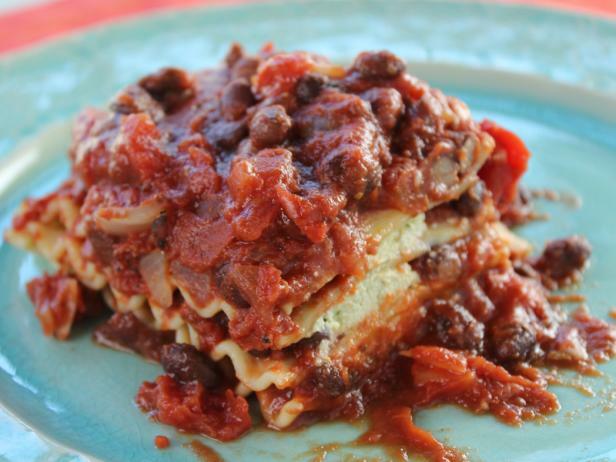 So maybe she isn’t coming in person, but her Black Bean Lasagna is. 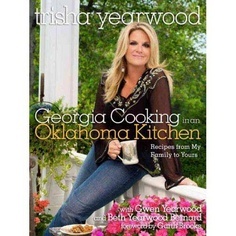 From Trisha Yearwood’s first cookbook. She has an updated healthier version, which is made with tofu and cashew nuts in place of the ricotta – since I am allergic to cashew nuts, I had to stick with the original version. 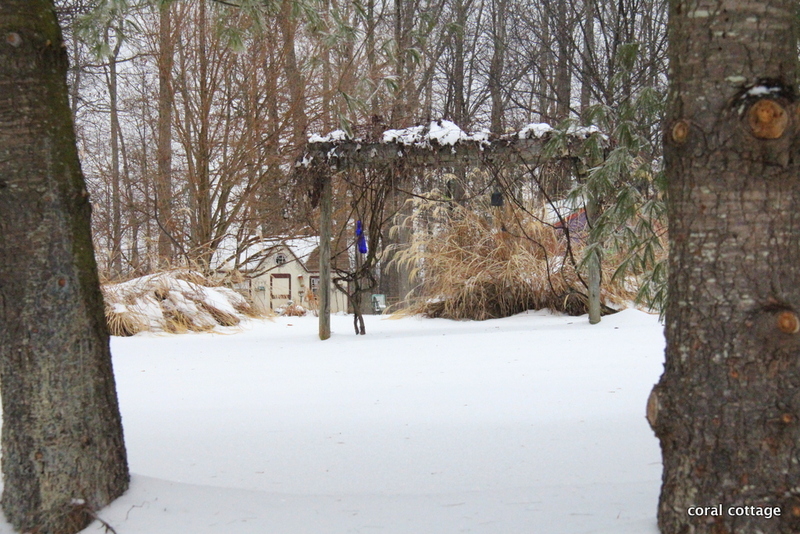 While the lasagna cooks I head out for some winter white photos. 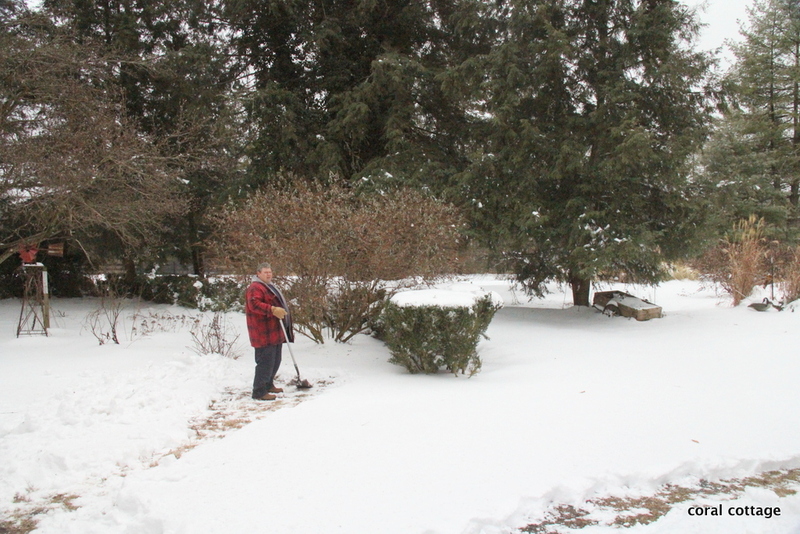 Mr. Cottage shovels paths in the snow so that the fur babies can get around. 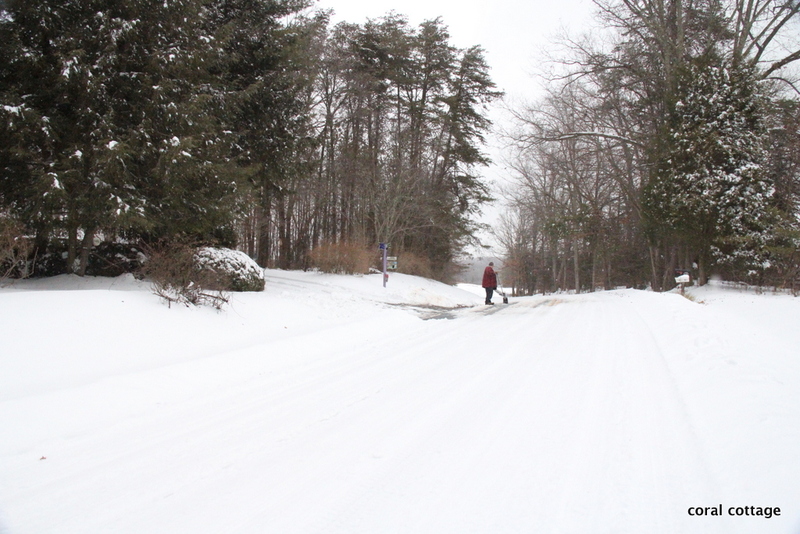 We had about 10 inches – in some places more with the drifting and all. Then rain set in for a while and flattened the fluffy. Grape arbor looking back toward the cottage and the studio. 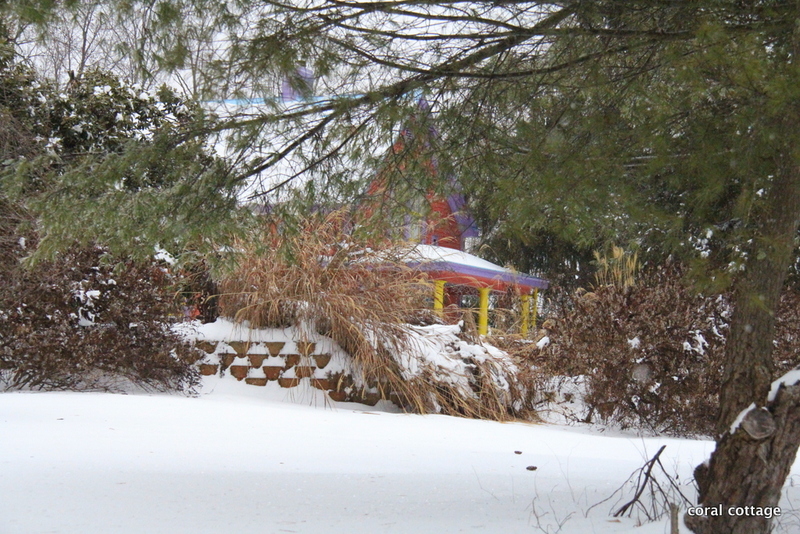 Quiet snow surrounds the studio. The brilliant blue of the wine bottle glows. 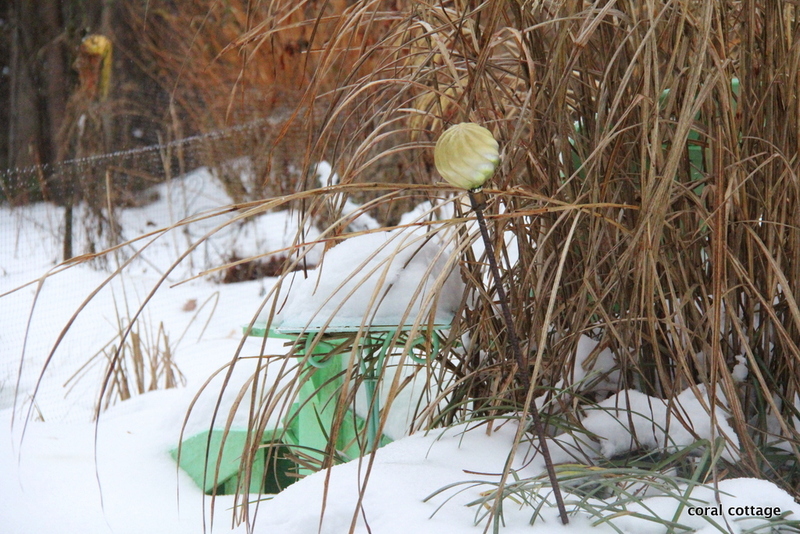 I like the sparse rose bushes against the stark whiteness of the snow. 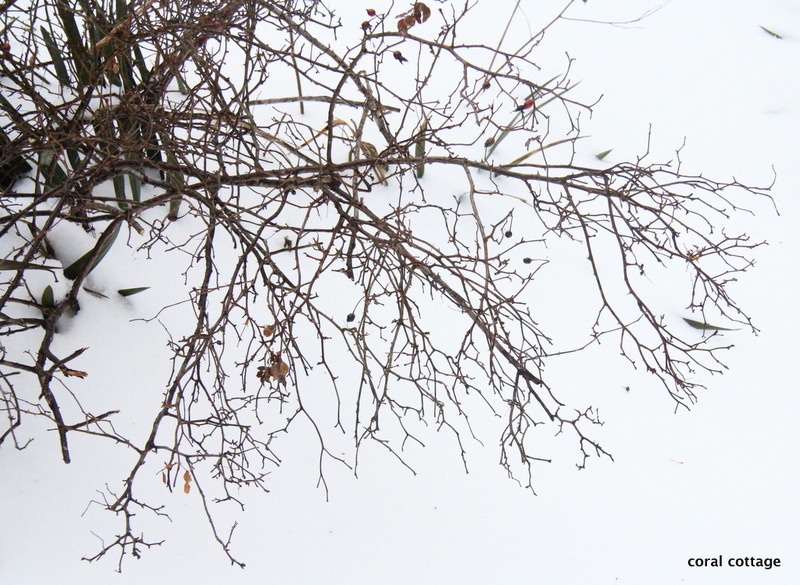 A few rose hips remain. 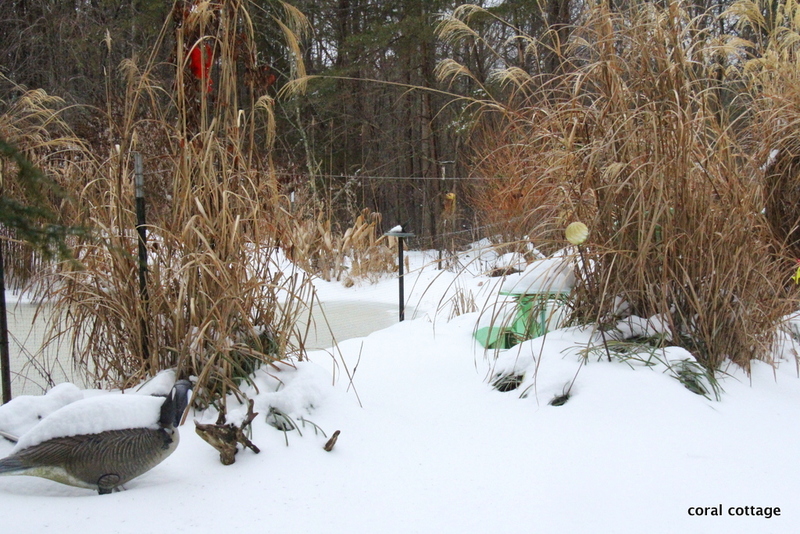 The pond is ice and snow-covered and still. 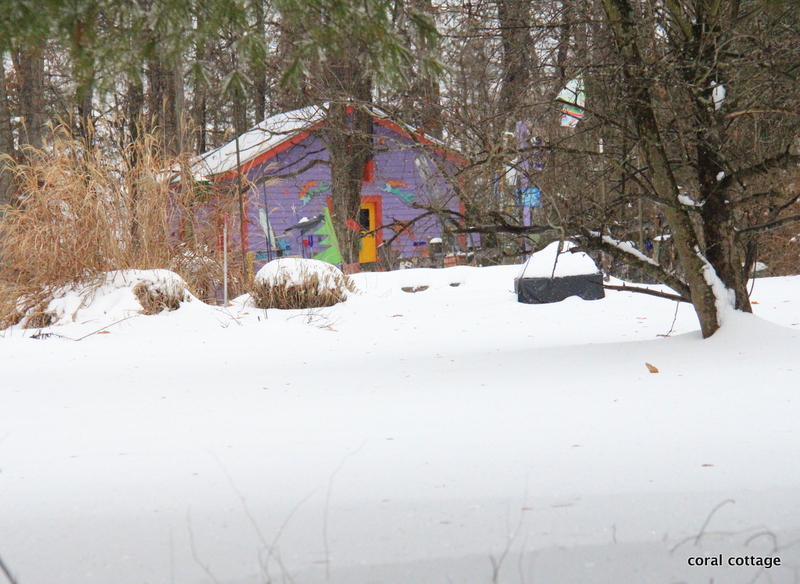 A view of Coral Cottage from the back side of the pond. On grey days like this, our cheerfully painted little cottage makes my heart very happy. We are expecting a few more inches of snow tonight. The lasagna was warm and yummy on this cold snowy night. Kim of Red Dirt Farm • This entry was posted in Cooking and tagged cooking, snow photography, trisha yearwood's black bean lasagna. Bookmark the permalink. Love, love, love your photos! 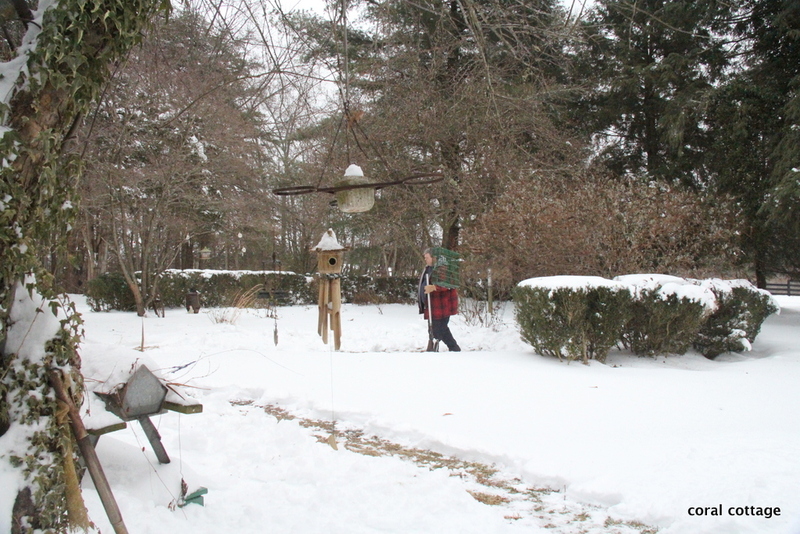 We have at least 12 inches and rain & sleet now on top with 3 to 6 inches coming after that through tonight.. & 6 more Friday night….Can anyone say “Spring, Please!! !” After breaking my body shoveling this ridiculous snow I had a similar thought regarding dinner. Apple & pork ragu over pappardelle. Yummy comfort food. Open invitation to you and Mr. Cottage ANYTIME!!! Stay warm & positive & THINK SPRING!!!!!! I’m envious. I wanted a little snow here. Everybody else got some. Dunno if I’ve told you this story but I was living in Atlanta one winter when it snowed. I was out playing in it in the dark like some kind of nut because I had never seen that AMOUNT of snow. I liked how it made everything so still and quiet. 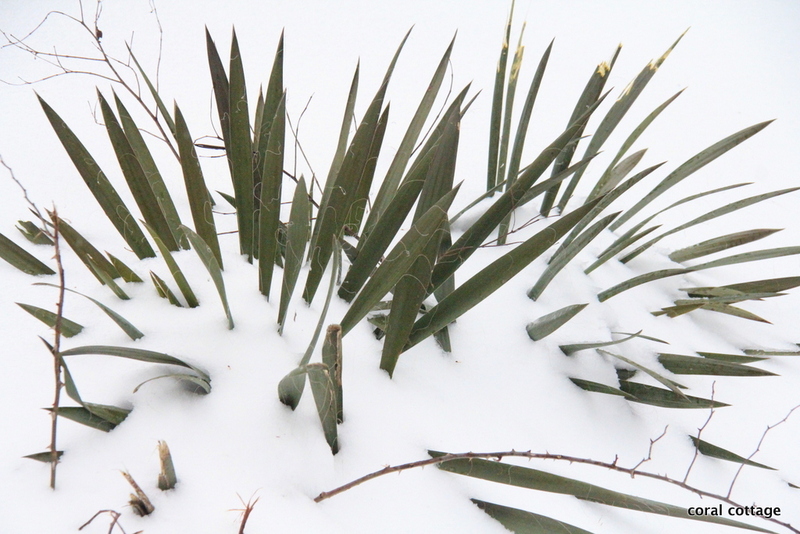 Those yucca look like swords in the snow. Coral Cottage has so much charm I can’t understand why you hang onto that ordinary suburban house in Florida. 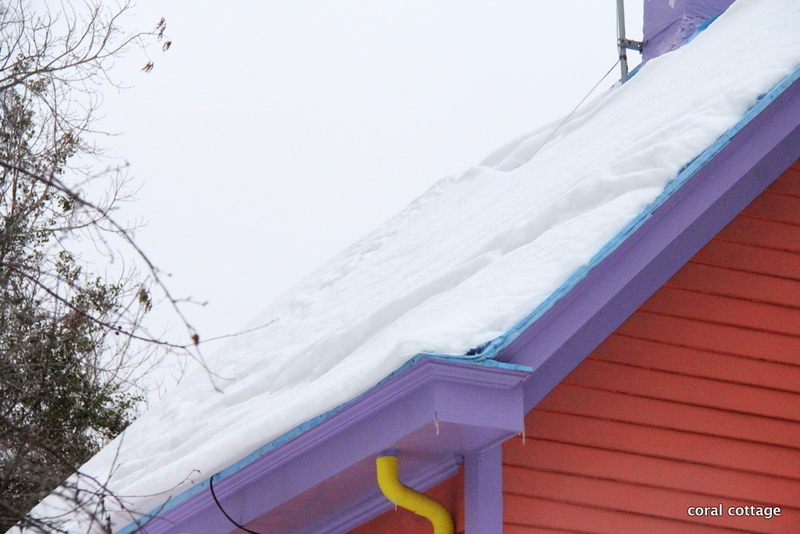 … but it would melt before it got here. I’m trying to get more organized — actually put names and addresses in my small rolodex — and, for the life of me, can’t find you addy. Email it to me again, will ya? The lasagna looks delicious! 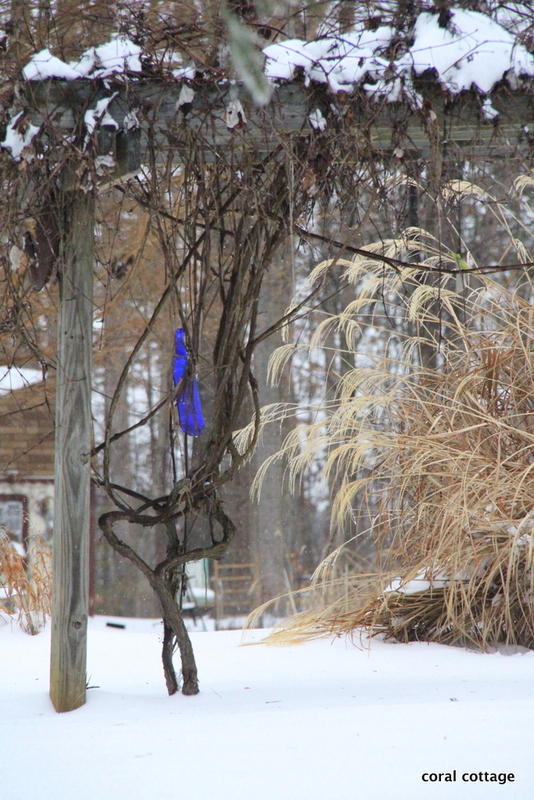 The photos are just beautiful – I love the contrasts of color against the snow. Beautiful snowy shots and your dinner looks delicious! Hi Kim! I was glad to see your posts-we have lots of snow too. I’m looking for signs of spring every day, and I’ve been hearing them and smelling them. A robin was singing this morning, and I can smell spring-it’s a ways off yet, like a few thousand miles away, but it’s in the air and headed here. I know it! Yum-your dinner looks lovely-and so do the flowers-what a sweet hubby! Hello Kim, thank you for taking the time to leave comments on my blog recently! Wow this white winter wonderland is quite magical although I realise it must be hard at times too. It’s such a novelty for us Australians! I was very surprised that we found street art out by the lagoon but it too made me laugh. We didn’t know to expect it the stunning blue in the glacier ice, although I have intensified it slightly in my editing, it was a very real, beautiful presence. The next day we saw it in the sunshine and the blues were far less visible.